← Penne With Brussels Sprouts And Bacon. Rhum For Pauline. 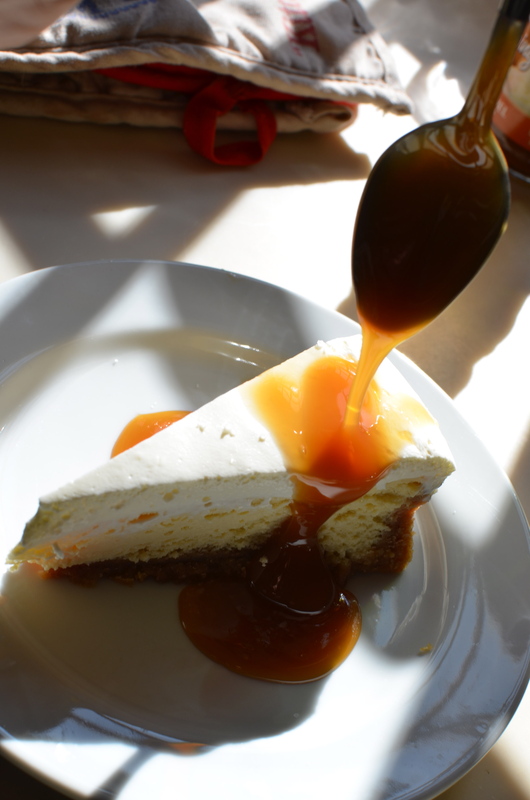 What we have might be one of the best cheesecakes on the planet. Of course, I am biased when it comes to the salted caramel thing. But, this cheesecake truly is special. 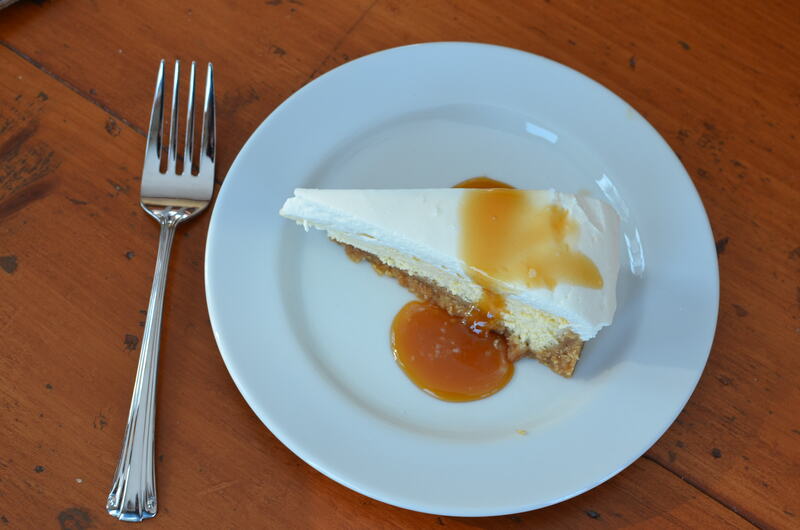 Ricotta makes the cheesecake lighter, whereas the brown sugar adds depth to the flavor. The sour cream topping is a bonus. 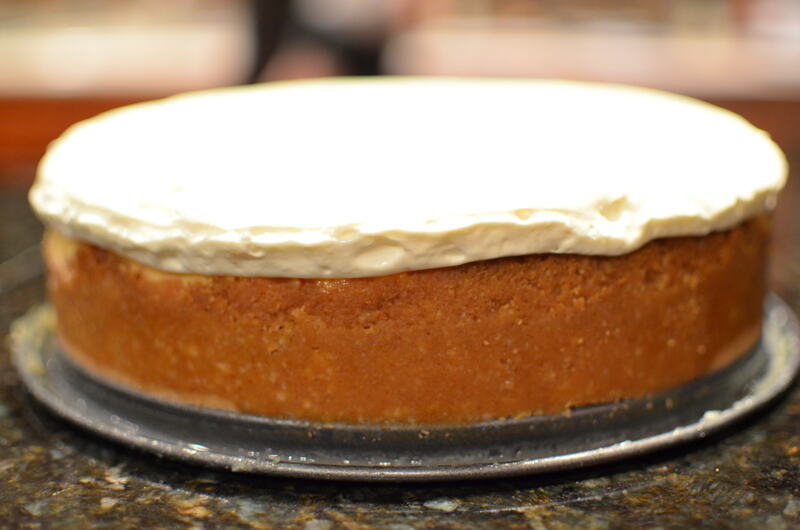 It provides the perfect tangy flavor foil to the sweet cheesecake and hides any surface flaws should the top of the cake crack while cooling. And then there is the dreamy caramel sauce sprinkled with sea salt. Swoon. 1. Place the half and half, butter and sugar into a saucepan over low heat and stir until the sugar is dissolved. Increase heat to high, bring to a boil and cook for 5-7 minutes or until thickened. Do not stir the caramel while boiling, but keep an eye on it so the caramel doesn’t scorch. Once thickened, set aside to cool. !. Preheat oven to 325℉. Lightly grease an 8-inch springform pan, then line with parchment paper. Wrap the outside of the pan with heavy-duty aluminum foil, making sure the entire bottom and sides are covered; set aside. 2. Place ground ginger cookies and ground almonds into a food processor and pulse a couple of times until they are mixed together. Add butter and process to combine. Press mixture into prepared springform pan and refrigerate for 1 hour. 3. Place ricotta and cream cheese in the bowl of a stand mixer and beat for 5-6 minutes or until smooth. Add the sugar and beat for another 3-4 minutes until well combined. Add the eggs one at a time, beating well after each addition. Add the corn syrup, salt and 1 teaspoon of vanilla and beat until well combined. 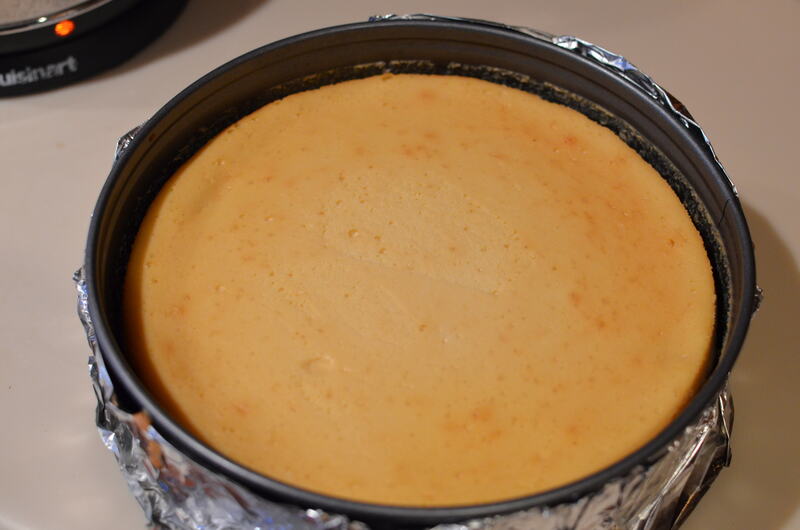 Pour the cheesecake mixture into the prepared pan. 5. 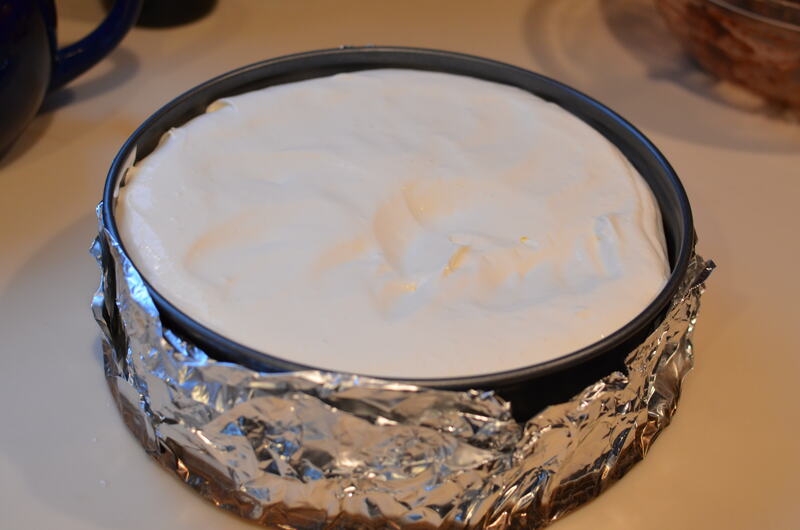 Remove cheesecake from the larger baking dish and allow to cool in the springform pan. Once completely cooled, refrigerate for 3 hours or until set. 1. Place the whipping cream, sour cream, confectioners’ sugar and remaining 1 teaspoon vanilla in a bowl and whisk until soft peaks form. 2. 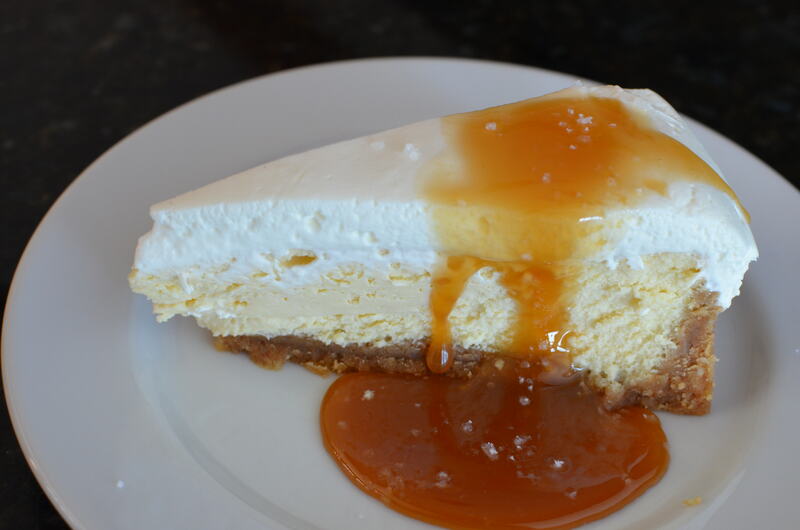 Top the cheesecake with the cream, drizzle with the caramel sauce and sprinkle with sea salt flakes to serve. Bake Yourself Silly is from The Leg’s album ‘An Eagle To Saturn’ set to be released next week. This song is just that mix of melodic and madness that I adore. “There are no stitches, ’cause there was no operation”. Check out The Leg on Myspace. Info about the Album Launch this Saturday can be found here. You can pre-order the new album at Song, By Toad Records. This entry was posted in Cake and tagged The Leg. Bookmark the permalink. 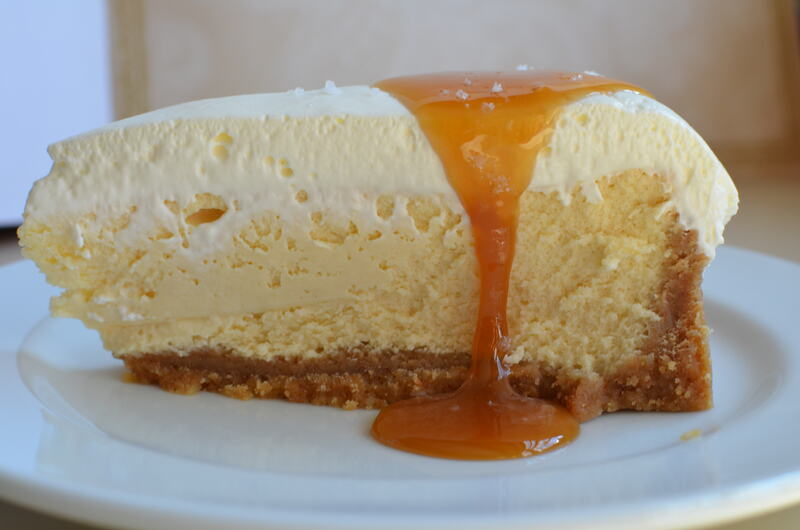 4 Responses to Salted Caramel Vanilla Cheesecake. Bake Yourself Silly With The Leg. Hey Tricia, will you make this for our piano gathering??? Yum!! It does look time consuming, so feel free to say no! This does look quite delicious!! Sure! I would love to make this for the piano gathering. Any excuse to make this cheesecake again! I think you all will really like it.